Floor joists form the base of a framed floor. They are the "bones" of the floor's structure that cross over the open square footage of the floor's space. Positioned at even intervals of 16 inches or so, the floor joists frame the floor by tying into the existing sills and girders around the inner perimeter of the floor's space. One way to install the joists requires the age-old art of "toenailing" floor joists into the existing structure. This technique requires the right size nails pitched at the right angle to drive the nails through the joists' ends to tie them to the frame of the building. Floor joists form the backbone of a floor's construction. The designations 8d, 10d and 16d for common nails do not denote the length of these nails. Instead, these numbers represent the cost of a box of 1000 of each nail type in the Old British currency. The "d" in 8d stands for "pennyweight" "Common" refers to the common length of each type of nail. What does denote the length of these nails is the word "common" An 8d common nail measures 2 1/2 inches, a 10d common nail measures 3 inches and a 16d common nail measures 3 1/2 inches. The increasing lengths coincide with an increasing thickness of each nail -- 8d commons are 0131 inches thick, 10d commons are 0148 inches thick and 16d common nails are 0162 inches thick. There is a lot to consider beyond these numbers, including other types of nails, such as the "box" and "cooler" type. Each type has different thicknesses and lengths from the "common" type. There are even further differences under each type of nail. But for floor joists, stick with "common" nails -- they are thick enough for the job and designed to support more weight than other nail types. Common nails are standard for floor joist installations. These facts help determine which nails are appropriate for which toenailing job. It takes three 16d common nails to toenail a joist into the header joist. The header joist is connected to an exterior wall and forms the perpendicular connection site for the ends of each floor joist. 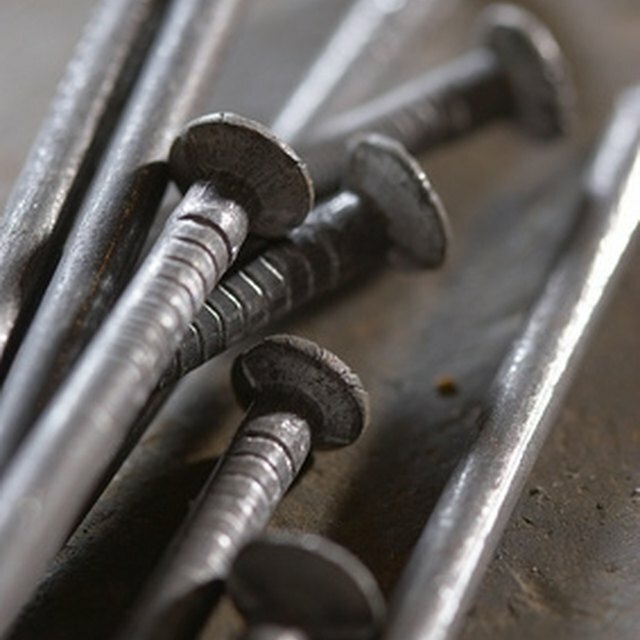 The 16d common nails also connect two overlapping joists to band them together, and also to band a joist to the sill or top plate through toenailing Stay with the longer 16d galvanized nails when toenailing a joist into concrete or wood. The length of the nail makes it long enough to pass through the joist and bore deep into the existing structure. Use shorter, 10d common nails to toenail the floor joists into the sill plate. The sill plate is the wooden board that rests on top of the foundation and anchored to it with bolts. According to William Perkins Spence, author of "Carpentry & Building Construction: A Do-It-Yourself Guide," 10d nails are also used to toenail the combined header and stringer joists. Toenail joists with 8d common nails when bridging to a joist or blocking to a joist. Both require two nails at each end. Bridging inserts a perpendicular piece of floor joist wood board between two floor joists to stabilize them and distribute weight evenly over them. Blocking to a joist does the same thing, but is used to support the load of long stretches of floor joists by inserting perpendicular wood board pieces between the floor joists at several places where the load is the greatest. The 8d nails are also used when toenailing a joist on a ledger connected to a beam with three 8d nails.